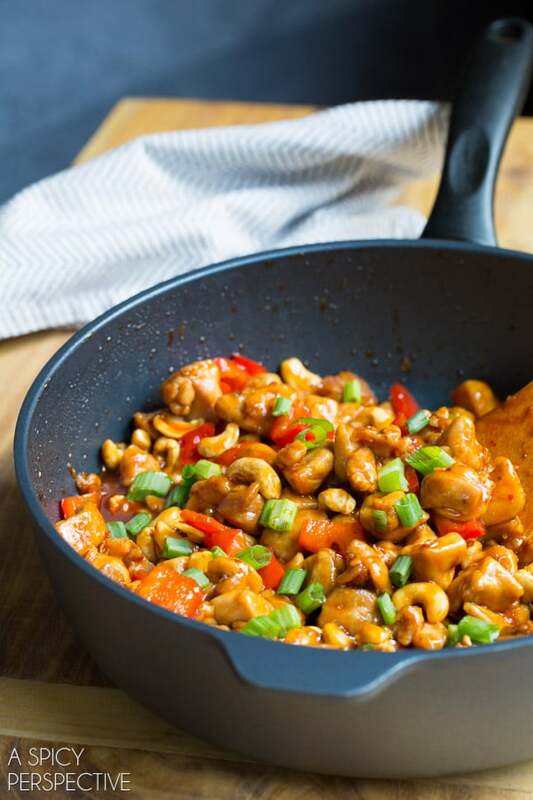 Whether you follow a paleo diet or not, this bold and tasty Paleo Cashew Chicken Recipe, will easily become a favorite mid-week go-to meal. Thinking healthy thoughts…. Thinking healthy thoughts. Our New Year Detox is underway, and I’m trying my best to ramp up our intake of greens, and get rid of processed ingredients this month. Yet one week in, and I’m already tired of salad for every meal. Something’s got to give. My plan to stay on the straight and narrow is to recreate some of our most-loved dishes into lighter cleaner versions of themselves. 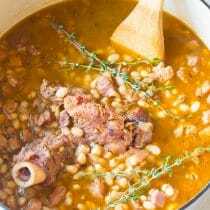 You can find quite a few “comfort food reborn” recipes sprinkled around our site. And today’s cleaned-up meal idea, my Paleo Cashew Chicken Recipe, is an instant favorite. Guaranteed. 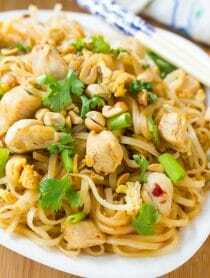 I’ve taken our classic cashew chicken recipe and substituted several paleo-friendly ingredients to make it (hopefully) fit into your eating plan this month. Since paleo eaters avoid grains, legumes, and processed sugar, I’ve removed the typical cornstarch, soy, and sugar. Then replaced them with arrow root powder to thicken, coconut aminos to add savory flavor, and palm sugar (or raw honey) to sweeten the Paleo Cashew Chicken Recipe. The verdict in my house is that this paleo version of cashew chicken is just as good, if not better, than the original. You still have the strong tangy essence of the original recipe, yet without the junk. The savory sauce is kissed with garlic, fresh ginger, a touch of palm sugar, and crushed red pepper. So it’s savory and a little spicy, bringing out the natural sweetness in the red bell peppers. Honestly, I love my new Paleo Cashew Chicken Recipe. I have a feeling we will be eating it a lot this year, no matter what diet we are following. And if you are planning to make some dietary adjustments this year, the substitute ingredients used in this recipe are nice to have on hand. 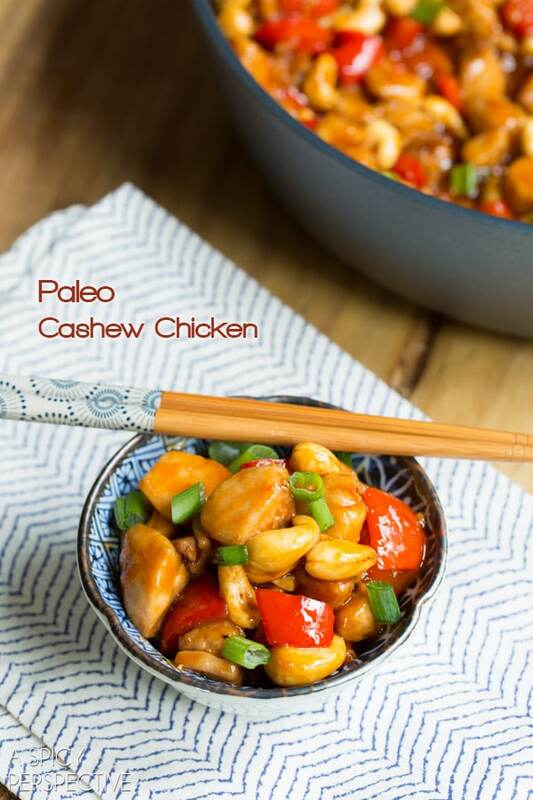 Easy Paleo Cashew Chicken Recipe. So tasty, you won’t miss the naughty ingredients. This is a quick healthy meal, easy enough to pull together on any night! If the sauce tightens up too much, add a little water to loosen it. Turn the heat off and add the chopped scallions. Serve warm with Roasted Cauliflower Rice. Made this recipe without the added sugar for Whole 30 compliance and it turned out great! Picky husband and child approved ??. This was so great! My husband and I made it together after work one night and we had fun making it. We reduced the honey by 2 tablespoons because we are watching sugar intake. It was delicious. We both have lunch tomorrow and we were thinking we would make a little more next time! Served with roasted cauliflower. It was awesome! Thanks for the great Paleo recipe. Thank you. This was delicious. I added celery and carrots to the recipe for extra veggies and everyone loved it. This is amazing!! Making it for the second week in a row. Quick and healthy recipe. 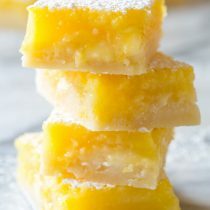 I personally would prefer a more savory, less sweet version… I made it with only half the honey and would cut actually back to just two teaspoons next time. Will make it again and try it with cauliflower rice next time! Made this for dinner tonight. Fantastic!! We loved it. We will definitely make this part of the regular rotation, plus it’s special enough to make for company. Just made this for lunch and my husband couldn’t quit talking about how amazing it was! So good! Made this tonight along with the cauliflower rice and both were delicious. Made with chicken breasts since that’s what I had on hand but next time I’ll use the thighs. Thanks so much. Have been working hard to find great recipes. My husband loved it too. Appreciate your efforts. foг a blog web site? The account helped mе a acceptable deal. 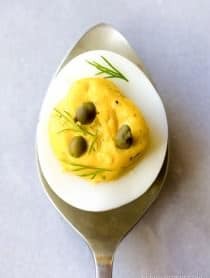 Great recipies! Thank you for sharing that! I made this tonight for dinner. I added chopped broccoli to it. The husband and I loved it! Thanks for the delicious recipe. What would be a good substitute for the Coconut Vinegar? I cannot seem to find it in Australia? Would Apple Cider Vinegar be ok? I’m following Paleo diet so can’t use rice vinegar as the replacement. Hi Tash, Yes I think apple cider vinegar would be acceptable in small amounts. Happy Cooking! So should I decrease the amount on your recipe instead of 1/4 cup? 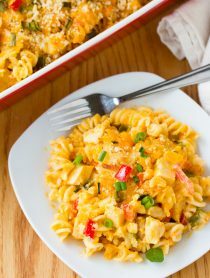 We just made this for dinner- it was fantastic- thanks for the recipe! Great dinner idea! My family would go crazy for it! My mouth is seriously watering… I totally feel you about the new years resolution… I debated whether or not to make my resolution as “eat more sugar.” ;) Because I know that’s what’s going to happen anyway. But the way I think about it is if I can cut back on the amount of junk I eat… I’m still making progress! 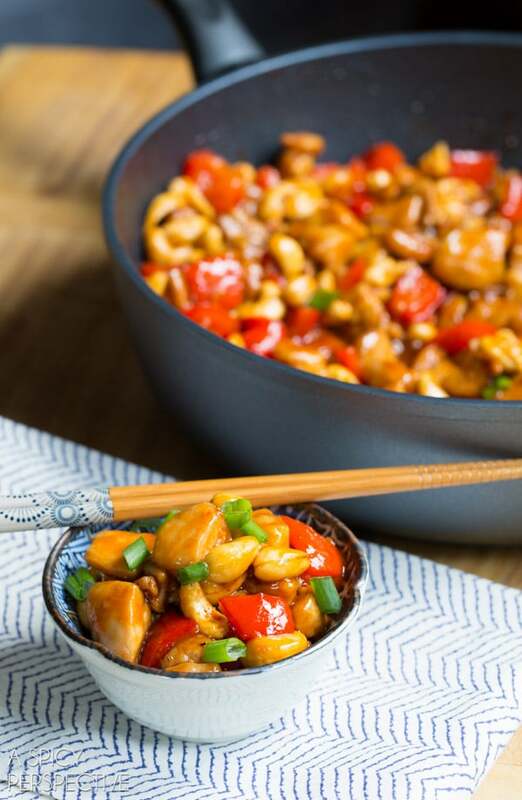 Love cashew chicken and your healthy version is more reason to devour this, soon! This has such pretty colors and looks both fresh and flavorful. Must give it a try! This is totally going on the menu for next week! Yummmm. 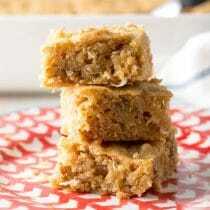 I am making this right now, AMAZING!!! wow This is perfect for me. I just discovered coconut vinegar and had no idea what I wanted to make with it yet. I’m definitely making this tonight!! This recipe looks quite good and i see that you list the replacement ingredients. IF i wanted to utilize the original recipe, would the amounts that are given for the replacement ingredients the same as would be for those original ones? Thank you in advance. 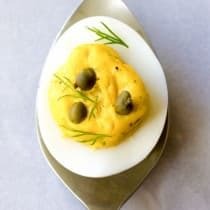 Sommer, this looks wonderful & I LOVE that it’s paleo too! I need more healthy, comforting meals during the week! This looks fabulous!! Wow, this looks so good and something my whole family would! Dinner tonight for sure! Yes and Yes! Dinner perfection! 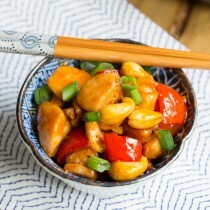 I was just looking for a great Cashew Chicken recipe and this sounds amazing! Funny – we had cauliflower chicken fried rice two nights ago for dinner! So good and easy!